To my mind one of the most exciting things about lantern clocks is that they were the very first domestic clocks. This means that occasionally we may be looking at the oldest known surviving domestic clock in a certain region. 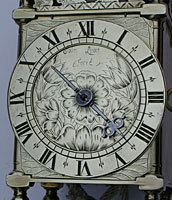 This is the case with the clock pictured here by John Lyon of Warrington. Not only was John Lyon the first clockmaker to work in Warrington, but he was in fact the first to work in the entire county of Lancashire - the oldest by whom any work survives. I find it absolutely amazing to be able to see and handle this clock, which is the oldest surviving Lancashire-made clock. We know of people termed clockmakers in old records, but none of these in Lancashire has left surviving work earlier than John Lyon. Of course there may have been clockmakers in the county before him, whose work survives, but if so we don't know of them yet, and no example of their work has yet been documented. What is even more astonishing is that this is the only known clock to survive bearing his name. But for the discovery of this clock some years ago by a studious collector, and the clock's being featured and illustrated in George White's book 'English Lantern Clocks' in 1989, we would know nothing about John Lyon apart from his name appearing in old records - such as when he supplied or repaired a local church clock. Our entire knowledge of his work and the beginnings of clockmaking in Lancashire hangs by this one slender thread. In fact until recently we knew John Lyon's name only because he supplied Wigan church clock in 1666 and that for St. Peter's in Bolton in 1671 - in which latter instance his name was recorded inaccurately as John Lynan, the "clocksmith". That is what these earliest clockmakers were - smiths who made clocks. We also know from the records of the Clockmakers' Company of London that he trained an apprentice named Thomas Stubbs, who moved to work in London. When Thomas joined the company as a "great clockmaker" in 1685 he was obliged to show proof of his apprenticeship, and the company duly recorded that he did so, having been apprenticed to John Lyon in Warrington. A "great" clockmaker was one who made large clocks, and we usually take this to mean turret clocks, which we know he would have learned to make under John Lyon. Taking a normal apprenticeship as being seven years, we know he must have worked for John Lyon as early as at least 1678, though apprentices sometimes stayed on to work for their master as journeymen after their apprenticeship term had ended. So from what we know of Thomas Stubbs we can assume that John Lyon worked from at least 1661 to at least 1678, and perhaps till 1685. Thomas Stubbs is known to have remained in London till at least 1698, having moved to work there in 1685, as we said. However a marriage at Warrington in 1689 of a Thomas Stubbs to Martha Oliver, might just be the same Thomas coming back to his old parish to marry a local girl he met when an apprentice there. A little research into Warrington parish registers reveals that John Lyon was married there on 16th August 1655 to Elizabeth Glasbricke, by whom he had several children between 1657 and 1672. We can now assess his overall dates as from at least 1655 till at least 1678, perhaps 1685. 1. Full view of the clock, signed 'John Lyon Fecit'. Very much in the London style, but considerably smaller than the regular height, standing 12 1/4 inches. Click for closer view. 2. The engraving of the name is clearly less skilled than the rest of the dial, implying it was added by the clockmaker himself rather than an expert engraver. The countwheel carries a casting mark known as the matchstick man, a feature which I believe was first documented by George White. This is a well-known mark of an unidentified London brassfounder, possibly located in Lothbury, who supplied lantern clock castings (principally of wheels) to several clockmakers in Lothbury and elsewhere in London during the middle years of the seventeenth century. This is evidence, if we needed it, that John Lyon bought at least some of his castings from London, which explains the very 'London' style of his clock. It has been assumed therefore that John Lyon was a mere 'retailer' of London-made clocks. On the other hand we know he was a very capable maker of clocks, capable enough for the church authorities at Wigan and Bolton to have given him the job of making their church clocks. Many provincial makers of lantern clocks bought their castings from London (others from Bristol, where there were also specialist brassfounders making lantern clock castings), probably because their demand for that type was not sufficient to have them made locally, or else it was easier to get them from specialist casters, even if at some distance. There was a clockmaker working in London in 1675 named Gabriel Stubbs, said to have served his apprenticeship in York, though he had been apprenticed in London in 1670 to Robert Seigniour, who had known York connections. Any connection between Gabriel Stubbs and John Lyon is unknown. Thomas Stubbs, John Lyon's former apprentice, could not have been the one supplying John with lantern clock parts, as the clock pre-dates Thomas Stubbs's time in London. This implies therefore that John Lyon has other contacts in the trade there before Thomas Stubbs moved there in 1685. The world of clockmaking was more closely connected than we sometimes appreciate, even as early as the middle seventeenth century. The dial is expertly engraved in a style very typical of London. Yet the blank zone at the top was left for the local 'retailer' to sign his name. John Lyon put his name in there, either engraving it personally or through the services of a local engraver, but the engraving of the name is clearly much less skilled than that of the rest of the dial. Although the countwheel clearly came from London, and probably the dial too, there is one aspect which is very unusual for London work and that is the size. This is what we sometimes call a three-quarter size clock. It stands in total height 12 1/4; inches against the normal regular height of 15 inches. The pillar heights are 8 1/4; inches, against the normal 10 1/4;. The frame width and depth is 4 3/4; inches against the normal 5 1/2. The chapter ring measures in diameter 4 3/4 inches against 6, and is 3/4 of an inch wide against the normal one inch. Miniatures are known as small as 6 3/4 inches total height, or as much as 9 inches total height. A three-quarter size is very rare. It is tempting to wonder whether John Lyon did have these castings made locally, and yet they do have the same style exactly about them as regular-sized London pattern castings and one or two of this same 'three-quarter' size by other London makers. We can't know all the answers, but it is a pleasure to be able to learn at least some of them.